The Embroiderer's Buddy puts embroidery in its place! 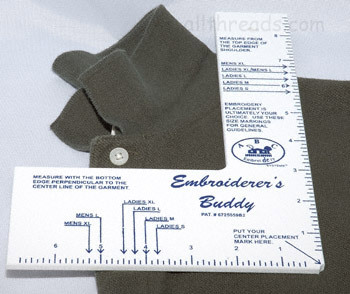 No more guesswork when positioning your embroidery design on shirts - the Embroiderer's Buddy ensures consistent placement every time, using industry-standard positioning. Simply align the marks on the Embroiderer's Buddy on your garment and instantly find the proper position of the center of your design. Works with Men's and Women's shirts, size Small to Extra Large. Just like the original Embroiderer's Buddy but works with children's shirts size 2-7 and youth shirt size 8-22. We recommend the Dritz Disappearing Ink Marking Pen for use with the Embroiderer's Buddy!